One of the best places to find a deal online is Amazon. However, not everything is the bargain it appears to be. Just as in the offline world, doing a little research pays. 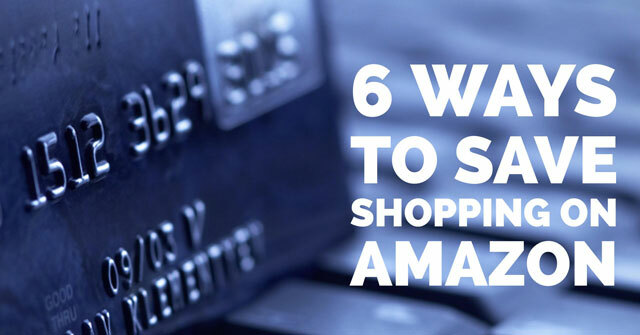 Check out these tips to ensure you're getting a great deal while navigating the virtual aisles at Amazon. Look for what you want in the bargain bins, found through a link named “Today’s Deals” at the top of every Amazon page. On the Today’s Deals landing page, you’ll find the Best Deals section loaded with bargains in every category, the Lightning Deals section with time-sensitive sales—lasting several hours or until the item is sold out—and a Deal of the Day discount of up to 75 percent off several items that change daily. There are a couple more links worth using: those to Amazon’s Outlet Center and Coupons pages. Don’t assume that any of the prices are the lowest available anywhere, especially if the seller is a third-party store. We've seen stores on Amazon sell products for as much as twice the retail price, often for products that are outdated or even obsolete. 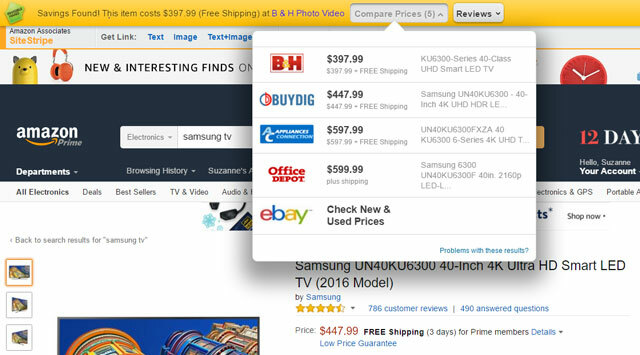 Check other retailers’ prices, and prices at specialty websites—Best Buy for electronics or Home Depot for tools, for example. If it is a hard-to-find item and you really MUST have it at any price, go ahead—at least you're making an educated choice. Using a browser plug-in, like InvisibleHand (for Firefox, Chrome and Safari), can make this process easy. When you're browsing on Amazon, the plug-in will display a notification pop up with the price and location of the better deal if it knows of one. Know what the real suggested retail price is of the product. Whether by design or error, it’s not that unusual to see inflated retail pricing so your discount appears higher than it actually is. If you find an item at Amazon and you’re hoping the price will fall later, consider CamelCamelCamel plugin for Firefox, Safari and Chrome. 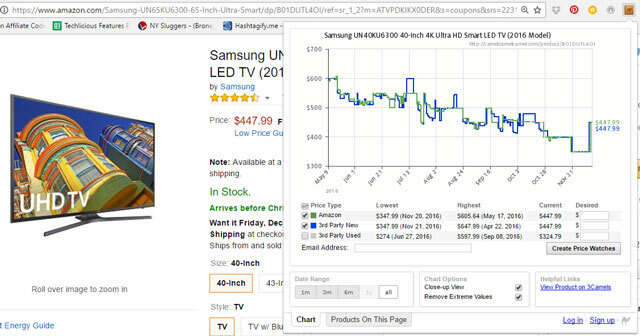 Once installed, you'll see a graph showing the Amazon price history, if it's available. You can also sign up to receive email alerts if the price drops below a level. Look carefully at who is selling and who is shipping the item you want. An item may be shipped by Amazon on behalf of another seller with a returns or exchange policy that is different from Amazon’s—and not to your liking. Items that are both sold and shipped by Amazon will be tagged as eligible for “Super Saver Shipping” or for free shipping via “Amazon Prime” (a $99 pre-paid premium membership plan). And check out a seller's feedback rating before buying. If it has very few reviews or a satisfaction rating less than 90%, you may want to take your business elsewhere. Super Saver shipping is available only if the total value of everything you’re buying at once is $49 or more—but being just shy of that minimum can push the cost with shipping charges past the price of the item elsewhere. In this case, check out Filler Item Finder. This sites suggest items on Amazon priced at exactly the amount you need—or slightly higher—to bring your order to $35. You can sort your results by category, including books, music, grocery and more. This article has been updated on 12/6/2016. In you bought a Kindle Fire tablet, you have automatically several days of Amazon Prime for free, which allows you to have free shipping. Or if you decide to actually pay the Amazon Prime fee, after a few buys, it pays by itself, plus you have the free movies and books. You can read Kindle books free if you are an Amazon Prime Member. You get one free book per month. I am not familiar with what plugins are or where to get them and where do you find the bargain bins? We added some links to the bargain bins in the story above to help you find them. A browser plugin is just a little application (program) that works with your browser. We have links to the shopping assistant plugins in the sections above. I learn so much from your website. I don’t have time to be a techie and there is so much information out there. You all make everything “techie” easy to understand. Thank you so very much! Glad you’re finding the articles helpful! Have you subscribed to our newsletter? I use the price checker plug in (Invisible Hand), which I read about in an earlier newsletter of your’s. I have found it to be very helpful. Thanks for all the info you provide. I really want to see the person im calling..please help me to fin out the location where she is because she always cheat me. Thanks this site: http://bit.ly/mesitetalkcashback you can make cheaper shopping on Amazon and at other over 5000 big shops. I wish you successful shopping! I use http://1cheaper.com they compare products across multiple online stores to find the cheapest price including delivery and coupons. If you are an Amazon Prime member and get an “Amazon Card” and use it, you get 5% back on every Amazon purchase. The refund comes back as a statement credit. There are some financing options as well but I don’t use those and am not recommending the card for that.